The results of several important and interesting studies were presented during this thematic session at the recent 16th Annual Congress of the European Society of Intensive Care Medicine in Amsterdam, The Netherlands. The first talk was an update on severe acute respiratory syndrome (SARS), the global threat that shook the world not too long ago. The human perspective was brought into focus as it was the most significant factor for the successful management of the epidemic. The results of the Antecedents to Cardiac Arrests, Deaths and EMergency Intensive Care Admissions (ACADEMIA) trial were then presented. In this study, it was found that an impressive percentage of patients who suffered cardiac arrests died or were admitted to the intensive care unit (ICU) after showing warning signs. More impressively, almost all of these patients (90%) were seen by a physician before the event. The necessity for isolating ICU patients with methicillin-resistant Staphylococcus aureus (MRSA) was examined in a 2-center prospective study in 2 mixed ICUs to assess the benefits of isolation compared with universal precautions. No significant effects on decreasing MRSA spread were seen in MRSA ICU patients by isolating them when universal precautions were followed. And finally, the saga of the ARDSNet, lung protective, low tidal volume ventilation for acute respiratory distress syndrome (ARDS) was settled as the final response from the Office of Human Research Protections became recently available. Thomas E. Stewart, MD, of Mount Sinai Hospital, Toronto, Ontario, Canada, presented the Toronto experience with SARS. By February 9, 2003, there were 305 cases reported to the World Health Organization (WHO) of a previously unknown severe respiratory syndrome. WHO released a Global Alert on March 12, 2003. One of the first victims of the disease was Dr. Carlo Urbani, a WHO infectious disease specialist who traveled to the Vietnam French Hospital of Hanoi on February 28, 2003. A patient had presented with an unusual influenza-like virus and an expert’s opinion was sought. The case in question was found to be SARS and Dr. Urbani died on March 29, 2003 in a Bangkok hospital. He contributed greatly to the early detection and containment of SARS. In Toronto, the index patient was a 78-year-old female who had visited Hong Kong between February 13th and 23rd and died at home on March 5. Family members developed the syndrome and presented to local hospitals. By July 10, 2003, there were 438 Canadian SARS cases and approximately half of them were healthcare workers. The Toronto experience was presented in a study in which 38 adult patients with SARS-related critical illness admitted to 13 ICUs in the Toronto area were followed until April 15, 2003. Of 196 patients with SARS, 38 (19%) became critically ill, 7 (18%) of whom were healthcare workers. The median age of these 38 patients was 57.4 years. The median duration between initial symptoms and admission to the ICU was 8 days. Twenty-nine (76%) required mechanical ventilation and 10 of these (34%) experienced barotrauma. Mortality at 28 days was 34% (13 of 38 patients), and for those requiring mechanical ventilation, mortality was even higher (13 of 29 patients, 45%). Patients who died were more often older, had pre-existing diabetes mellitus, and on admission to hospital were more likely to have bilateral radiographic infiltrates. In another study examining the impact of SARS on healthcare workers, 164 healthcare workers from 2 university ICUs were quarantined and, of them, 16 (10%) developed SARS. It appeared from this study that healthcare workers rarely become critically ill, and although certain practices may place them at higher risk, adequate infection control precautions were probably effective. Affected patients had primarily single-organ respiratory failure, and half of mechanically ventilated patients died. Dr. Stewart underlined what an important factor fear was in the fight against SARS. Frontline workers were at the highest risk and, in order to saves lives, they had to deal with rapid change. In another study by Scales and colleagues, it was shown that SARS acquisition is a threat to healthcare workers. SARS developed in 6 of 31 persons who entered a patient’s room, including 3 who were present in the room for more than 4 hours. SARS occurred in 3 of 5 persons present during the endotracheal intubation, including 1 who wore gloves, gown, and an N-95 mask. The syndrome also occurred in 1 person with no apparent direct exposure to the index patient. 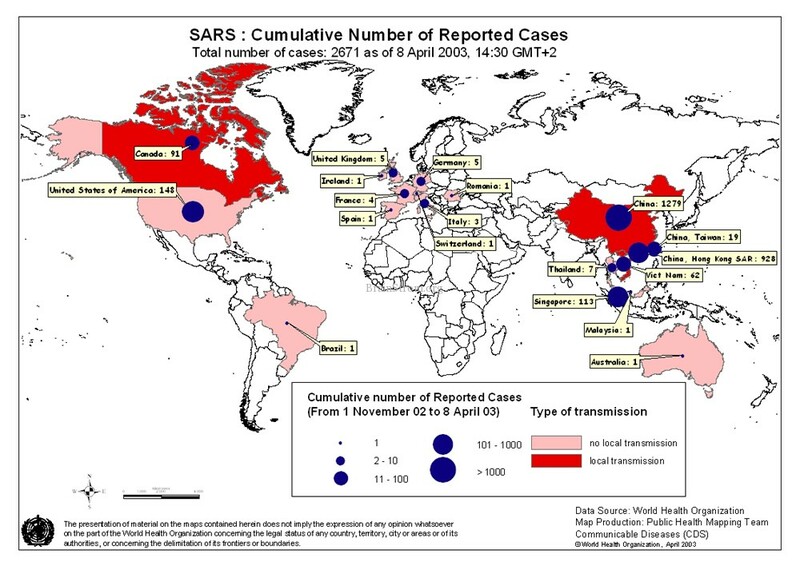 In most, but not all cases, developing SARS was associated with factors typical of droplet transmission. What is interesting in this study was that SARS developed in 1 healthcare worker despite the fact that the worker wore fully protective gear (N-95 mask, gown, and gloves). Additionally, SARS developed in a healthcare worker who had no identified contact with the index patient or with any other persons known to have SARS, which makes the containment of the infection even more difficult. SARS significantly affected the ability of the Toronto hospitals to deliver healthcare. ICUs were closed and personnel had to be quarantined for more than 10 days. Additionally, personnel had to function while always taking extreme precautions, including wearing uncomfortable masks and gowns. Healthcare workers were separated from their families, risking the possibility that they would become infected and potentially die of the disease. Dealing with fear was the most important issue. Despite the considerable stress, healthcare providers chose to stay and work, thus placing the lives of their patients ahead their own. Juliane Kause, MD, of Portsmouth, United Kingdom, presented data on the ACADEMIA trial. The aim of the ACADEMIA trial was to estimate the incidence of deaths, cardiac arrests, and unplanned ICU admissions. Another goal of the study was to describe the various physiologic characteristics and their relationships to these events and to assess the feasibility of a larger-scale study. ACADEMIA was a 3-day prevalence, multicentered, international (United Kingdom, Australia, and New Zealand), prospective, observational study, including patients aged 16 years or older. Exclusion criteria were visitors and relatives, patients who died on arrival to hospital, and out-of-hospital cardiac arrests. Important collected data per primary event were physiologic antecedents, if the patient was seen by a doctor prior to the primary event, and the “do not resuscitate” (DNR) status. All primary events were defined as in-hospital cardiac arrests, deaths, and unanticipated ICU admissions (ie, not elective surgery). The antecedents, which were recorded up to 24 hours before each event, were the presence of a threatened airway, abnormal respiratory rate (respiratory rate less than 5 or greater than 36 breaths/minute), bradycardia or tachycardia (pulse rate less than 40 or greater than 140 beats/minute), hypotension (systolic blood pressure < 90 mm Hg), mental status changes (Glasgow coma score [GCS] decrease of at least 2), and prolonged seizures. All these measurements and observations were timed and compared with the primary event. A total of 93 hospitals were enrolled, mostly in the United Kingdom (69), 2 in New Zealand, and 21 in Australia. A total of 1103 acute beds were enrolled in the study. There were 683 events recorded, and the majority of these (383, 60%) were associated with an antecedent. A total of 1032 antecedents were recorded. The most common antecedents overall were a fall of the systolic blood pressure below 90 mm Hg, a fall in GCS, a threatened airway, bradypnea, and bradycardia. Most of the events happened within 15 minutes before the arrest, but a significant number of antecedents (290, 28%) took place more than 8 hours before the arrest. Most common antecedents occurring within 15 minutes before the event were a fall of the GCS, hypotension, threatened airway, bradycardia, and bradypnea. Most common antecedents recorded 15 minutes to 24 hours prior to the event were hypotension, GCS fall, threatened airway, and tachypnea. There were 168 deaths associated with antecedents, and 12% of these were not in DNR patients. In 9 of these patients, the physician was not aware of the event for more than 1 hour. In cardiac arrest patients with antecedents (112 of them were not DNR patients), 34 patients were not seen by a doctor for more than 1 hour. The antecedents to unanticipated ICU admissions were hypotension, GCS fall, threatened airway, and tachypnea. There were differences in the recorded primary events and antecedents profile between the United Kingdom and Australia-New Zealand. In summary, in this study, most patients with potentially salvageable serious events had recorded abnormalities in vital signs up to 24 hours before the event. Many severe pathophysiologic abnormalities were continuously present for up to 24 hours before serious outcomes; and nearly 90% of potentially salvageable patients with antecedents are seen by a doctor before a serious event. There are differences in primary events and antecedent profile between United Kingdom and Australia-New Zealand, which probably reflects structural differences in the organization of health services of these 2 regions. Geoffrey J. Bellingan, MD, from the Bloomsbury Institute of Intensive Care Medicine, London, United Kingdom, presented a study on source isolation for MRSA patients. MRSA prevalence is increasing in the United Kingdom, and standard precautions require single-room patient isolation. This may require additional financial and nursing resources, while many hospitals may lack sufficient single rooms. There are no trials looking at isolation as a factor alone. Studies usually include isolation in the context of surveillance or contact precautions so the exact role of isolation in preventing the spread of MRSA is unclear. Additionally, many studies do not apply to the adult ICU because they are for neonates in whom isolation is easier and less costly. It is noteworthy that the baseline background level of MRSA prevalence in these studies is often low. Despite recommendations for screening and isolation of patients with MRSA, there has been little uniformity in ICUs in the United Kingdom on this matter. In a study by Hails and coworkers, questionnaires were sent out to ICUs in the United Kingdom, followed up by telephone interviews. In 217 (96%) ICUs that responded, there were marked variations in patient screening, staff screening, infection control procedures, isolation of colonized and infected patients, and ward discharge policy. In all, 16.2% of ICU patients were found to have been colonized or infected with MRSA. Based on this information, this study was performed. It was a 2-center, prospective study performed in 2 mixed ICUs to assess the benefits of source and cohort isolation over and above universal precautions. The study lasted for a year, and all patients admitted for more than 48 hours were studied. Patients were screened for MRSA colonization (nose/groin) on admission, and weekly thereafter. There were 3 study periods in the study. In the first and last 3-month periods (phase 1/3), MRSA-positive patients were moved to single rooms or cohort bays. In the middle 6 months (phase 2), patients were not moved if they became colonized. Universal standard precautions for infection control were always used independent of study phase. The patient population was similar in each phase. There was no significant difference between the 2 ICUs in compliance with handwashing/disinfection, regardless of patient dependency or presence or absence of MRSA. There were 437 patients studied in phase 1/3 and 418 in phase 2. Of these patients, 68 (15.6%) had MRSA in phase 1/3 and 69 (16.5%) in phase 2. There were no differences between the 2 phases regarding percentage of patients becoming colonized with MRSA, infected with MRSA in the ICU, and outcome. The rate of acquisition of, or infection with, MRSA and mortality were similar whether patients were moved or not, and this was confirmed by multivariate analysis of risk. Actually, there were fewer patients colonized or infected during the nonisolation period, although this difference did not reach statistical significance (65 vs 51 patients). It was concluded that when universal precautions are used, patient isolation does not affect MRSA transmission and may not be a policy requirement for such patients. Finally, Roy G. Brower, MD, of Johns Hopkins University, Baltimore, Maryland, discussed the issue of “ARDSNet Controversy: Clinical Trial Design and Patient Safety.” The well-known trial received considerable publicity regarding its safety, and Dr. Brower presented the details and outcome of the controversy. A few words about the various departments involved in the evolution of the events: under the Department of Health and Human Services in the United States is the Office of Human Research Protections (OHRP) and the National Institutes of Health (NIH) research department of extramural research. Under the latter is the NIH ARDSNetwork. The OHRP monitors various institutional review boards (IRBs) and the NIH ARDSNetwork for patient safety and compliance with the pertinent regulations. Before the study in question, there were concerns and data from experimental or small human studies that physicians were ventilating patients with ARDS using higher than optimal tidal volumes (Vt), thus contributing to further lung injury. A study was then designed and undertaken by the ARDSNet. In this study, the traditional high Vt used at the time was compared to a lower Vt derived from previous small human studies. The levels selected were 12 mL/kg vs 6 mL/kg of predicted body weight respectively. A significant decrease in mortality favoring the low Vt group was seen, and the study was stopped because a significant clinical benefit was demonstrated. In 2001, the Fluids and Catheters Treatment Trial (FACTT) was initiated. Similarities to the Vt trial were the hemodynamic protocols (2 arms: fluid-conservative vs fluid-liberal) and that all patients were ventilated with a Vt of 6 mL/kg. The controversy began in July 2002 when a complaint to the OHRP was filed by intramural investigators, followed by the voluntary delay of the FACTT study by the NIH. The question was the selection of the optimal and the control Vt used to ventilate ARDS patients. There were concerns that the high Vt (12 mL/kg) used as control was higher than the “routine” Vt traditionally used by physicians caring for ARDS patients. Additionally, the lower Vt may also contribute to excess mortality as they suggested the existence of a “U” shaped mortality curve (higher mortality at either end) associated with various Vt as plateau pressure changes. Finally, there was no “routine care” study group that might have demonstrated a better outcome if included. The ARDSNet researchers responded that the selected Vt was consistent with traditional recommendations, published surveys of clinical practice, and current practice. The lower Vt was set at 6 mL/kg based on 4 previous encouraging clinical studies, one phase 2 randomized clinical trial (RCT), and on contemporary clinical recommendations. ARDSNet used the traditional design for process-of-care trials in which 2 differing approaches were compared. Requirements for this approach include sound physiologic rationale for both approaches, both approaches in clinical use by proponents, and equipoise or substantial uncertainty. When using this approach, “routine care” groups are not included. Several significant recent ICU trials have used this approach, including one by Rivers and colleagues. The ARDSNet reply was that both studies were appropriately designed in relation to safety; and there is no evidence for a “U-shaped” relationship between mortality and plateau pressure. Additionally, there is no evidence to suggest a safe level of plateau pressure. Finally, the 6 mL/kg Vt strategy was already associated with low mortality in 2 large RCTs. An independent review board was established by the NIH, and the report published in August 2002 suggested that there were methodologic problems with the Intramural Investigators’ analysis. It stated that both ARDSNet trials were appropriately designed in relation to patient safety. Additionally, the report said that the FACTT trial should be resumed. Despite the NIH review of the ARDSNet trial, OHRP requested that NHLBI continue to suspend the ARDSNet trial until OHRP had completed its own internal review. Finally, the OHRP reported that “risk to subjects participating in the ARMA trial were minimized and reasonable in relation to the anticipated benefits to the subjects and the importance of the knowledge that was expected to result.” It also stated that the FACTT trial could resume without changes to trial design or study procedures. The OHRP recommended improvement of the patient consent process and the IRB review process and further discussion on similar topics. Dr. Brower concluded that the traditional trial design can minimize risk and enlighten clinical practice, and there should be increasing expectations for rigor with IRB overview and informed consent. The seriousness of the SARS epidemic reminds us how vulnerable we are against viral infectious agents with a respiratory/droplet mode of transmission. Patients without known exposure to the agent may become sick. Half of those who become intubated die. Healthcare workers are at particularly high risk; and it appears that in similar circumstances, full protection may not offer absolute safety. Although healthcare workers rarely become critically ill, high vigilance to the occurrence of suggestive symptoms, even in low-risk individuals, should always be exercised. MRSA is an increasing global health problem, and patient isolation has been part of the management protocol in many hospitals. The efficacy of this approach has not been examined in a prospective study, despite the fact that isolation is a significant additional cost of care along with barrier precautions and decontamination. In the study by Hails and colleagues, a large variation was demonstrated in MRSA policies, procedures, and prevalence in English ICUs. The study presented by Dr. Bellingan showed that if barrier precautions and strict hygienic measures are to be applied, patient isolation may not be necessary. It is an interesting concept, which could lead to significant savings and improved patient care. The findings question the current widespread (but also widely underapplied) dogma of MRSA patient isolation, so new studies are required before these findings may become standard medical practice. The common knowledge that many urgent inhospital events are actually predictable was eloquently demonstrated by the ACADEMIA study, presented by Dr. Kause. The majority of the patients, who died from a cardiac arrest or had to be transferred to the ICU, had easily recognizable warning signs of an imminent disaster, in some cases 24 hours earlier. Almost all of them had been seen by a doctor within the previous 15 minutes, so it is hard to understand why these events eventually occurred. One possible explanation is that these patients were already very sick, so the warning signs of hypotension, tachypnea/bradypnea, tachycardia/bradycardia, airway compromise, and mental status changes were not properly evaluated. On the other hand, these antecedents may have been present in many other patients who did not have an arrest. In any event, this study underlines the need to individualize care and to spend more time at the bedside. Simple, cheap, easily obtainable bedside clinical signs in the context of the particular patient may give invaluable information that may save a life. The only requirement this approach entails is more time spent with the patient. Dr. Brower’s presentation hopefully puts an end to a year-long ongoing saga. The ARDSNet study has been declared as safe, well designed, and applicable to everyday clinical practice by the OHRP; and the FACCT study should never have been stopped. There is room to improve the process of informed consent, but this does not decrease the validity of the findings. Was this turmoil necessary? One could argue that every measure protecting patients’ safety should be pursued in expense of time and additional financial costs. In December of 2002, the American Thoracic Society sent a letter to the OHRP expressing, among other things, the concern that OHRP’s investigation would convey the message to the public that “the process of clinical investigation cannot be trusted” and might be a “major impediment to future research in critical care and other disciplines.” This was actually the case, as these events received considerable publicity. Three months earlier, a letter questioning the trial’s safety was sent to the OHRP by the Alliance for Human Research Protection, reflecting the public concerns that enrolment into this study may have jeopardized the participants. Although the study now has been declared to be safe and well conducted, there is concern that what is left for the public is a feeling of suspicion and mistrust toward the scientific-medical community. It is noteworthy that after reviewing the analysis, which sparked the controversy, the independent panel concluded that there were “methodological problems with the intramural investigators’ analysis.” Should we be more careful next time? SARS is a very virulent agent that can affect persons without previous documented exposure to it. Most patients who die from a cardiac arrest or are admitted to the ICU have shown warning signs. Isolation may not be necessary for MRSA patients. The ARDSNet low-Vt trial has been declared as safe and well conducted by the OHRP. Stewart TE. Thematic session on hot topics. Results from the most recent clinical trials in intensive care medicine. SARS (severe acute respiratory syndrome). Program and abstracts of the 16th Annual Congress of the European Society of Intensive Care Medicine; October 5-8, 2003; Amsterdam, The Netherlands. Kause J. Thematic session on hot topics. Results from the most recent clinical trials in intensive care medicine. ACADEMIA (Antecedents to Cardiac Arrests, Deaths and EMergency Intensive care Admissions): predicting cardiac arrest. Program and abstracts of the 16th Annual Congress of the European Society of Intensive Care Medicine; October 5-8, 2003; Amsterdam, The Netherlands. Bellingan GJ. Thematic session on hot topics. Results from the most recent clinical trials in intensive care medicine. Challenging the dogma: do we have to isolate patients with MRSA? Program and abstracts of the 16th Annual Congress of the European Society of Intensive Care Medicine; October 5-8, 2003; Amsterdam, The Netherlands. Brower RG. Thematic session on hot topics. Results from the most recent clinical trials in intensive care medicine. ARDSNET: controversy regarding clinical trial design and patient safety. Program and abstracts of the 16th Annual Congress of the European Society of Intensive Care Medicine; October 5-8, 2003; Amsterdam, The Netherlands. http://www.pitt.edu/~crippen. Accessed November 21, 2003.
http://www.researchprotection.org/ethical/ARDSNet090402.html. Accessed November 21, 2003. Here is some interesting background information on S.A.R.S.